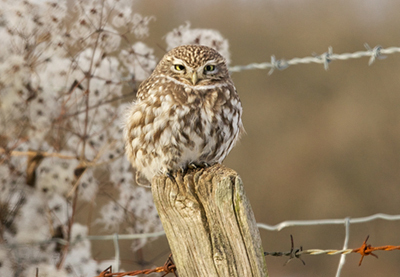 Little owls were introduced into Britain so aren’t natives here. They hunt mostly at dawn and dusk and they don’t only eat small mammals and grubs – they also sometimes enjoy plants and berries. Little owls have a great homing instinct and often return to the same nesting place for decades. When alerted, the Little Owl bobs its head up and down to help it to judge distances and potential threats.